In 1994, Caddenhead bottled an expression like no other. A 17 year old Bruichladdich that was distilled in 1976. The best thing here is that they left it at full cask strength. So we are talking about a peaty muscle here that just doesn't leave any questions unanswered. That is if you are asking if this is peaty, strong and hell-a-good. It is all of that and even more! 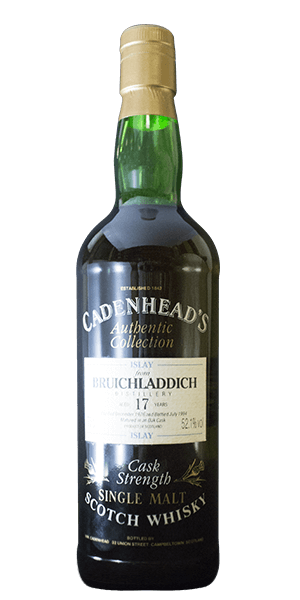 What does Cadenhead's Bruichladdich 17 Year Old 1976 Cask Strength taste like? The Flavor Spiral™ shows the most common flavors that you'll taste in Cadenhead's Bruichladdich 17 Year Old 1976 Cask Strength and gives you a chance to have a taste of it before actually tasting it.